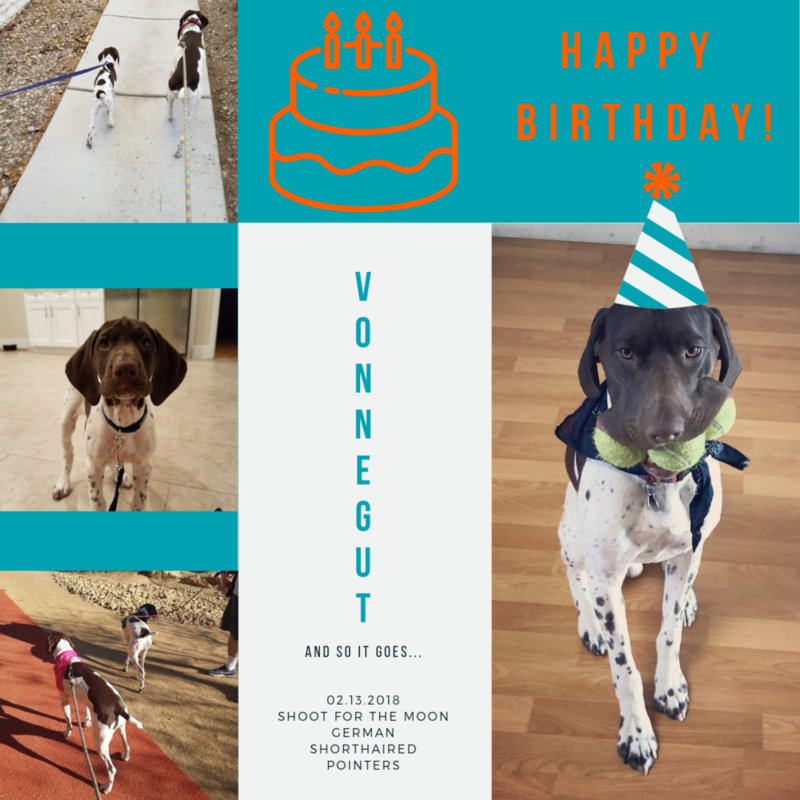 Today is Vonnegut’s first birthday! I’ve been talking about my baby boy’s birthday this week and am convinced a couple people at work think I have a skin kid. After all, I mentioned that I needed to make treats to bring to daycare, so what else would one assume? Vonny loves being my sous chef, so he did help me bake mini peanut butter cupcakes, or pupcakes, last night. Joey and he were so excited about the taste test, this may surpass the Peanut Butter Shorthairs for favorite homemade treat. I saved a couple pupcakes for home, but arranged the rest in a cake pan and wrapped it up to bring to the Hydrant Club. And it the way that parents with skin kids often do, I dealt with a flurry of activity getting us out the door on time this morning. After gym, walks, breakfast, and getting ready for work, it was time to load the van and go. I gotta tell you, with a work bag, lunch, bag, two leashed dogs, and a pan full of pupcakes, there was some strategy in getting loading. Being the genius I am, I brought out my bags and the pupcakes first, placing the pupcakes on the roof of the van, above my door so I’d be sure and see them when I hopped in. Putting the pupcakes in, then letting the dogs in, and walking around to my side seemed too tempting and I didn’t want the pupcakes gone in 15 seconds. I ran back inside, grabbed the doggos, and got them situated in the van. Now, the gas light was on, so I needed to make sure I had my Costco card and could stop for gas quickly after dropping the kids off. As we were backing out of the garage, the neighbor with the Husky was walking by, so everyone needed to do looks out the window and good morning barks. We cruised out the back gate and interestingly enough, it was about 15 seconds later that I realized the pupcakes were not in the van. Of course, neither Vonnegut or Joey had any idea I was freaking out. They thought we were going to daycare, but then I pulled into Baskin Park and that’s a fun place for them, too. I slowly pulled into the Baskin lot and said, “Well, they’re either there or they’re not,” and gingerly opened the door, half expecting the pupcakes to come raining down on me. And there they were. Magically safe. The ingredient list flew away, but the pupcakes were safe. Honda Odyssey: The Cadillac of Minivans.